Responding to the expose made by Catch News on how BJP went on a real estate buying spree in Bihar days before the demonetisation scheme was announced, Congress asked Prime Minister Narendra Modi and BJP President Amit Shah to reveal the source of the money with which all these properties were bought. The grand old party also asked the BJP to make public the account details of its national and state units. "Modiji and Amit Shahji should answer where did this money come from? They should also answer whether BJP and its functionaries made such deals elsewhere in the country in the last six months. Account details of BJP's national and state units for the last one year should also be made public so that everything becomes clear. It would also expose Modji's farce of curbing black money," Congress' chief spokesperson RS Surjewala said. The Congress leader also congratulated Catch News for exposing how land worth crores were bought in the name of BJP and Shah. 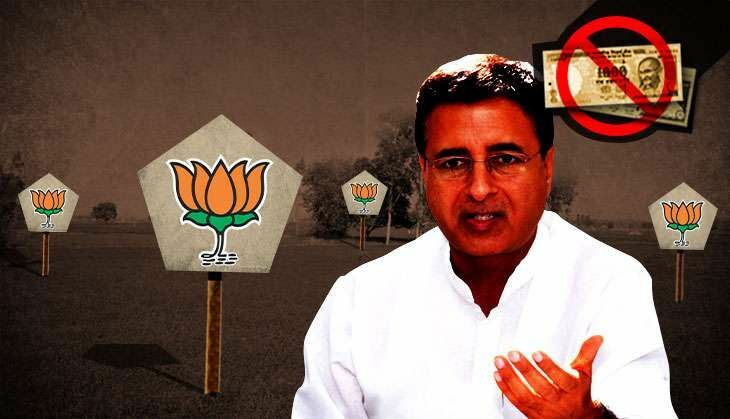 "This proves that demonetisation is a huge scandal and with this expose, the ground for constituting a Joint Parliamentary Committee (JPC) has strengthened further," Surjewala said. The Opposition has been demanding a JPC to probe the "selective leaks" about the demonetisation scheme which it alleged has benefited the BJP. Accusing the BJP of finding this unique way of turning its black money into white, the Congress gave out details of all the land deals that had been reported by Catch News earlier. Congress also claimed how the BJP and black money are closely related and cited recent revelations wherein Rs 3 crore of old currency notes were deposited into BJP's bank account in West Bengal prior to the prime minister's announcement of currency ban. "The country also saw how the common man was struggling in queues to get Rs 2000 notes while BJP leaders were posting photos with bundles of notes on social media. And, one of the revelations made by Chaurasiya, member of the Bihar assembly who is also with the BJP, on Friday has proved that out the 6% black money in circulation, BJP has a share which isn't small rather huge," Congress said. Labeling it as one of the biggest scams in India, the Congress accused the prime minister and BJP president of an "insider dealing" to park the party's black money in real estate. "Therefore this land deal which took place few days or months before 8 November flies in the face of Modiji who has inconvenienced the farmer; the common man who has his daughter's wedding; and the people who are waiting to be treated in hospitals. Today, he has inconvenienced the common man in the name of the secrecy, a secret which he shared only with Amit Shah," Congress spokesperson Sushmita Dev alleged. Pointing that BJP should be ashamed of making such deals, the Congress said it shows that BJP is a corrupt party which is dealing in black money today. "You should be ashamed," said Dev. Meanwhile, as witnessed over the last two weeks, both the houses witnessed multiple adjournments after a united Opposition sought an apology from the prime minister for calling them "supporters of black money". Members of Opposition parties rushed to the well of Rajya Sabha raising slogans like "Pradhan Mantri Maafi Maango (Prime Minister should apologise)." Ghulam Nabi Azad, the leader of opposition in Rajya Sabha, was heard saying, "Prime Minister says Opposition is favouring black money. This is an insult of the House and the Opposition. When we have said we are against black money, when the entire Opposition has said the same, how can he say that? Prime Minister should apologise." Even BSP supremo Mayawati made strong objections to the prime minister's remarks and said if the Opposition was informed 72 hours prior to the announcement of the scheme, they would have praised the prime minister. Even JD(U) 's Sharad Yadav, SP's Ramgopal Yadav and Trinamool Congress's Derek O' Brien sought an apology from the PM for calling the entire Opposition supporters of black money. The Opposition yet again reiterated its demand that the prime minister be present in the House when the issue of demonetisation is being discussed. The prime minister did make a brief appearance on Thursday and had since been missing from action in the Rajya Sabha. On Thursday, former Prime Minister Manmohan Singh launched a stinging attack on the Modi government and said, "In the process of demonetisation, monumental mismanagement failure has taken place. Today, there are no two opinions in the country. And in fact, it is a case of organised loot and legalised plunder. It is important to take note of the grievances of the common people who have suffered." Taking a jibe at the prime minister, Singh said, "I would like to know from the prime minister the names of any country he may think of where people have deposited their money in their banks, but they are not allowed to withdraw."